The King of Summer just can't get enough of the Brew City! After sold-out shows in 2013 and 2016, Kenny Chesney has announced that Miller Park will once again be a stop on his 2018 'Trip Around the Sun' tour. After playing a lighter tour schedule in 2017, the 8-Time Entertainer of the Year is back to his usual tricks with an 18-stadium tour featuring, quite possibly, his biggest lineup to date. Hitting the road with Chesney in 2018 are two of Country Music's biggest rising stars in iHeartRadio Country Artist of the Year, Thomas Rhett, and ACM New Group of the Year, Old Dominion, along with up-and-coming artist Brandon Lay. In addition, a copy of the Live in No Shoes Nation album is included with each ticket purchased to this year's 'Trip Around the Sun' 2018 stadium show. Ticket purchasers will be contacted via email with more details. Coming to the concert? Check out our A-to-Z Guide to the Kenny Chesney Trip Around The Sun Tour concert at Miller Park for important info on everything from cameras & carry-ins to traffic & weather! American Express Seating will go on sale Saturday, October 21 at 10:00 am CT and be available while supplies last. Limit of 8 tickets per customer. To access, click the link below and utilize your American Express card at checkout. Secure the best seats in the house! 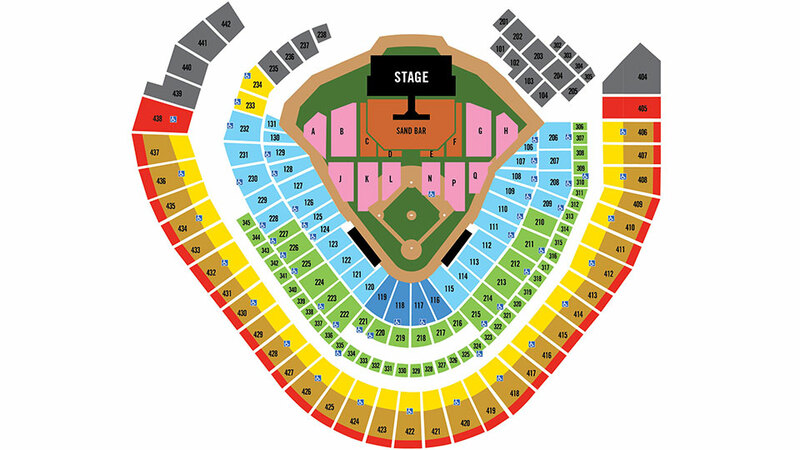 Platinum seats are located on the floor, as well as in most seating bowl locations, and are variably-priced based on location. Platinum seats are available to all customers and do not require a password. These seats will go on sale Wednesday, October 18 at 10:00 am CT, and will be available while supplies last. Limit of 8 tickets per customer. Thank you for your interest - Platinum Seats are now sold out. Thank you for your interest - the VIP Packages are now sold out. *CHESNEY VIP PACKAGE DISCLAIMER INFORMATION Please note the 'Summertime Early-Entry Sandbar Package' purchasers will be contacted via email a few days prior to the event date with additional program details. All other package purchasers do not need to be contacted with any further details. All sales are final. There are no refunds or exchanges under any circumstances. All packages and package contents are non-transferable. VIP merchandise will be shipped directly to each package purchaser; some exceptions may apply. Delivery of VIP merchandise could occur after event date. Package purchases are restricted to U.S. & Canadian addresses only. Information provided at the time of purchase (name, address, email, etc.) is the same information that will be utilized for individual contact requirements as applicable. The artist, tour, promoter, ticketing company, venue or any other affiliated parties are not responsible for outdated or inaccurate information provided by the consumer at the time of purchase. Commemorative VIP laminates are for commemorative purposes only. The VIP laminate does not gain or authorize access into the venue, VIP or any backstage areas. Thank you for your interest - the Old Dominion 'Stars in the City' Fan Experience is now sold out. Parking: Parking lots will open at 2 pm. Parking is no longer available to purchase online. Parking will be available to purchase upon arrival for $30. Alternate Transportation: The Route 90 bus will not be running for this event; check with MCTS regarding service. Please check with local establishments on running shuttle services. Gate entry: There are five major gates at Miller Park. All attendees will be required to go through a fan screening process which includes walking through metal detectors. Please be sure to allow extra time for the screening process, locating your seats, buying memorabilia, and getting your wristband (if you have floor/sandbar tickets). Anyone with a SANDBAR ticket MUST ENTER the Third Base Gate at Miller Park. Upon entering with a valid Sandbar ticket, ticket holders will receive the appropriate wristband needed to access the floor and enter the sandbar area. NO EXCEPTIONS. Anyone with a FLOOR section ticket must obtain a field access wristband to access the Floor section seating. Each individual must be present and have a floor seating area ticket in hand. Ticket must have a valid barcode and the perforation strip intact. Wristband stations will be set up outside of Miller Park at the pedestrian bridge and by the Home Plate Gate on the Miller Park Plaza from 2:30-3:30pm. Wristband stations will also be set up inside Miller Park on the Field Level concourse near sections 110, 118, and 126 beginning when gates open. For your safety and those around you, we ask that you keep the aisles clear. Please do not stand on seats. Standing on seats is very dangerous and will not be allowed by security. Tickets are available online here at brewers.com/Chesney, as well as at the Miller Park Ticket Office. The Ticket Office will be open at 9:00 am on the day of the event and remain open until Kenny Chesney takes the stage.